← Sarasota, Florida.. Grouper Paradise! Tap..taptap..tap its 4am and for the last three days, I awake to the sound of the raindrops that play a steady drumbeat while hitting the metal rooftop of the adjoining room. The intense climactic down-pours are very sporadic and carry the sound similar to a drum symphony during a finale. 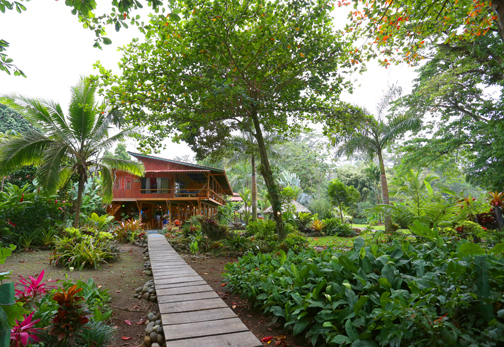 It looks as though the wet or (green) season has started early this year in Puerto Viejo. The town of Puerto Viejo, meaning “old port” is on the southern Caribbean coast of Costa Rica approximately 10 miles from the country of Panama, just south of the city of Limon and should not be confused with Puerto Viejo Sarapiqui, a small town located in the north mid-part of the country. Puerto Viejo is a popular tourist destination known for it’s clean blue waters, beaches, surfing, green foliage and alternative life styles. The beaches and waters are less than optimal near the shore in the rainy season due to the mud run-off from the tropical rains, however, surfing is still considered fantastic with the ever-present warm Caribbean winds propelling plenty of wave action. 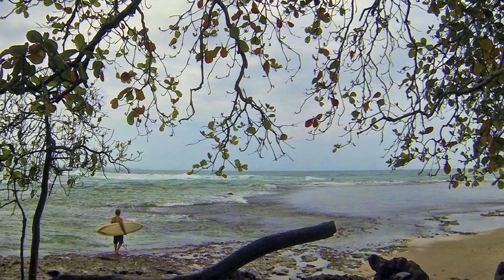 Puerto Viejo is home to “Salsa Brava” the most popular surfing area in Costa Rica. An area not recommended for beginning surfers due to the deep hollow waves that could reach mountainous heights and pound a surfer into the long shadow reef beneath. Salsa Brava is renowned for claiming many broken bones and surfboards over the years. Many experienced surfers call this area suicidal. Numerous indigenous communities inhabit the Caribbean Coast including the Cocles, Bribrís, Talamanca and Cabécar, as well as a large Afro-Caribbean population. Small roadside bars and restaurants flank the road and offer delightful savory Caribbean-Creole infused Cuisine. The laid-back reggae music and cannabis supporting life-style seems to be the norm for the area. 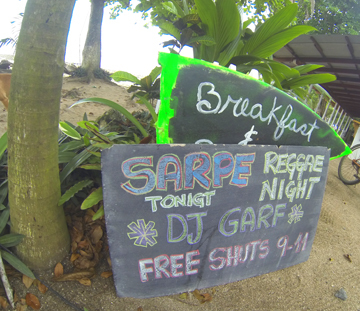 “Small roadside bars and restaurants flank the road and offing delightful savory Caribbean Infused Cuisine. 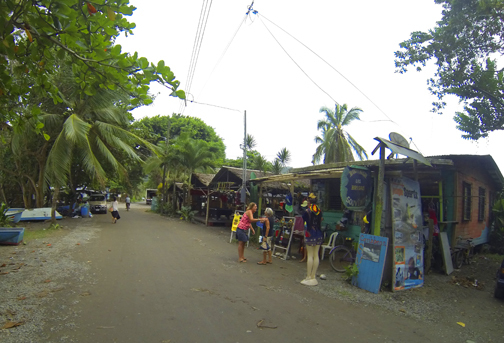 The small beach towns of Cahuita and Puerto Viejo can be quite intimidating to tourists. Many of the locals are extremely poor and live in dire conditions. Metal security fences and bars cover the doors and windows of many local resident homes. Theft runs rampant and the local thieves will grab and run with anything of value. Most of the crime is just petty and tourists are advised to leave all expensive jewelry, large cameras or cell phones in their hotel rooms. The hotels recommend carrying only what you need. We passed through a couple of police checkpoints on the coastal highway in a heavy agricultural area with the police’s attention focusing on theft of the “Peach Palm” or the “Pejibaye Palm Tree”, a local favorite fruit with the taste and texture similar to a sweet potato. Our hotel, the Banana Azul (Blue Banana) is constructed of light and dark hardwoods throughout with a very inviting open lounge area. Situated between the main highway and the beach, the hotel is surrounded by heavy foliage of tropical plants, trees, and a Koi pond that borders and runs the length of the patio. The atmosphere is somewhat secluded and filled with the indigenous sounds of the tropics, creating a favorable mood of solitude. You can hear the waves of the Caribbean Sea crashing against the beach about 150 feet or so from the hotel’s patio. “The atmosphere is somewhat secluded and filled with the indigenous sounds of the tropics, creating a favorable mood of solitude”. Our bedroom offers an eclectic décor with the floors covered in beautiful hardwoods, Asian style bamboo ceilings, sliding parlor doors framed in a beautiful dark red mahogany and glass. 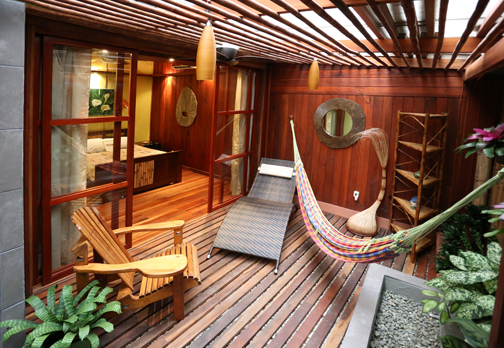 A colorful hammock hangs in the adjoining room which has a rock garden, accompanied by a huge tub constructed in miniature shades of aqua green tile. A large grey porcelain shower stall adjacent to the tub completes the extended part of the hotel room. The hotel has approximately 16 unique rooms, which includes a small apartment building in the front. Complimentary Wi-Fi is available throughout the hotel and the beach area. Fresh fruit mixed drinks and full bar service is offered along with some pleasing cuisine options in the restaurant. The food is good and moderately priced. Accompanying the regular menu is a chef’s special created every night which was satisfactory. We love the hotel, staff, décor and location, it was just as we imagined it to be and beyond. A tour operator offering several types of local activities is located near the entrance of the hotel. We chose to visit, “Jaguar” and “Tree of Life”, both wildlife rescue centers. The Jaguar wildlife center had several types of native monkeys, snakes, birds, butterflies and sloths. The sloth is most common to this part of Costa Rica. 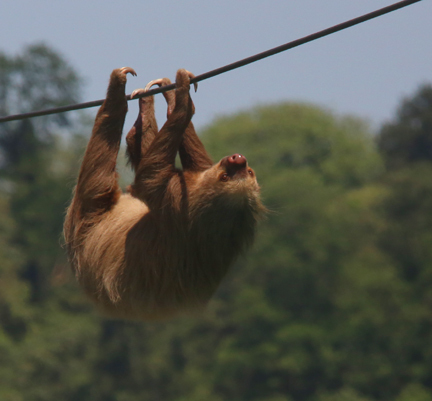 We captured the photo below of a “Two Claw Sloth” walking a power-line, a regular occurrence that has contributed to many deaths of the breed. Although very rainy in April, the temperature was just perfect for a visit. It seemed the heavier rains came mostly at night and early morning which didn’t affect the daytime activities as much. 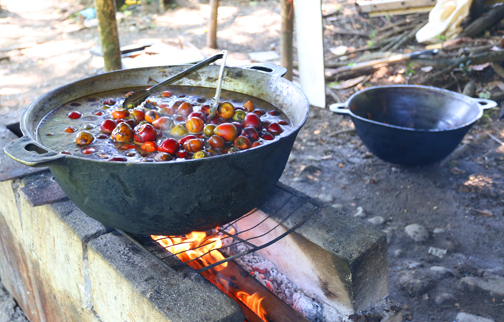 I enjoyed the relaxation, serenity and the local cuisine of the area. I hope to return again soon. This entry was posted in Dining, Essential Travel Devices, Worthy Destinations and tagged april travels, cahuita, Costa Rica, Costa Rica Vacations, east coast costa rica, limon, limon provinceon, peach palm, puerto viejo, salsa brava, surfing, travel costa rica. Bookmark the permalink.